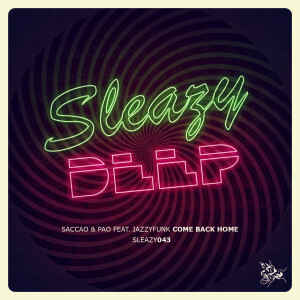 Keep keep keepin’ on, Sleazy Deep continue the Nu Skool Disco Flex with more deep house and killer sonics from our greek don and ever-consistent chart smashing Saccao. This time around he’s teamed up with Pao from Diynamics Art Is A Consequence and involving the vocal talents of JazzyFunk forming some crazy super duper phuture group for the floors. Come Back Home is a warm bass driven stormer, disco beats and twisting effects leading to JazzyFunk’s lush vocals singing I know, She Know’s. Now you know, this is a BOMB with killer keys and pads driving throughout. First up on remix duties are The Equalizers keeping the song vibe alive hard here with super HOT disco beats and working the lush keys to amazing effect. We absolutely love this version here; it’s the big one! Next our homie, (who’s set to feature on Sleazy G) Rafael Cerato turns the pressure up and seriously bangs this from the outset. just sit back and let the HUGE bass drop and arps send the floor into a hypnotic state, a serious delivering of killer proportions from a producer who’s appearing on all the top labels!!! Sleazy G’s recent number 1 smasher Vintage Culture now steps up with some hot & funkin’ work – more disco and bass driven and that vintage flare tears this one throughout. There really is something for everyone here and yes! Again, THIS IS ESSENTIAL!! !